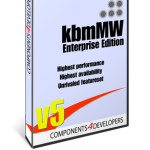 ANN: kbmMW Professional and Enterprise Edition v. 5.04.20 released! We are happy to announce v5.04.20 of our popular middleware for Delphi and C++Builder. Support for scheduling multiple parallel child jobs for recurrent runs. 5.04.20 Nov 12 2017 New stuff ========= - Added ability to Schedule batches of tasks as one job, similarly as Run. Using Schedule, it can be recurrent. Fixes ===== - Updated several database adapters with various fixes. - Fixed error popping up in TkbmMWCustomHashItem when range check is enabled in compiler. - Fixed bugs in kbmMWScheduler. - Fixed leaks in kbmMWScheduler related to scheduling of batches of tasks. - Fixed TkbmMWLockFreeHashArray2.Enum not returning AKey2 value. This shows up if one enable the nice debug flag KBMMW_MREW_NOTIFY_LONG_LOCKS_DEBUG (generally not to be used in production). It ensures that deadlocks due to locking will show up in the Windows monitor with exact info about which thread(s) held the lock and the type of lock. - Fixed off by one in counting when to GC a service instance resulting in leaving one too little left when minimum of instances has been defined. - Fixed service GC issue when a service has a very long running operation that times out and thus should be removed, resulting in less than defined minimum number of instances. 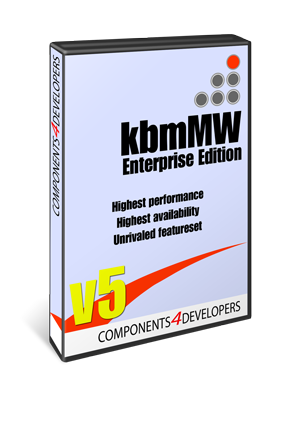 - Fixed kbmMWMT database adapter's resolver to not require a table name. - Fixed TkbmMWConfiguration. Changes/minor additions ======================= - Updated MT demo to match current kbmMW version. - Significantly improved XML SaveToObjectNotation and LoadFromObjectNotation. Amongst other s added the following options: mwxonoAutoIdentifyArrayElement - Set to include i=IndexNumber of array attribute. mwxonoReservedNameAsElement - Set to not interpret id and type names but instead treat them as elements. mwxonoAutoNumberUnnamedArrays - Set to add array level to unnamed arrays. If not set, sub array will have same name as parent. - Added BSON as storage format for TkbmMWConfiguration. - Added Prepare...Storage utility methods to TkbmMWConfiguration to easily setup specific storage type. - Added kbmMWConfiguration sample. - Added SetDateTimeTimeZone to TkbmMWDateTime, which specifically sets a datetime with a specific timezone. - Added ability to Schedule batches of tasks as one job, similarly as Run. Using Schedule, it can be recurrent. - Updated several database adapters with various fixes. - Fixed error popping up in TkbmMWCustomHashItem when range check is enabled in compiler. - Fixed bugs in kbmMWScheduler. - Fixed leaks in kbmMWScheduler related to scheduling of batches of tasks. - Fixed TkbmMWLockFreeHashArray2.Enum not returning AKey2 value. KBMMW_MREW_NOTIFY_LONG_LOCKS_DEBUG (generally not to be used in production). with exact info about which thread(s) held the lock and the type of lock. in leaving one too little left when minimum of instances has been defined. defined minimum number of instances. - Fixed kbmMWMT database adapter's resolver to not require a table name. - Updated MT demo to match current kbmMW version. - Significantly improved XML SaveToObjectNotation and LoadFromObjectNotation. instead treat them as elements. mwxonoAutoNumberUnnamedArrays - Set to add array level to unnamed arrays. If not set, sub array will have same name as parent. - Added BSON as storage format for TkbmMWConfiguration. datetime with a specific timezone.